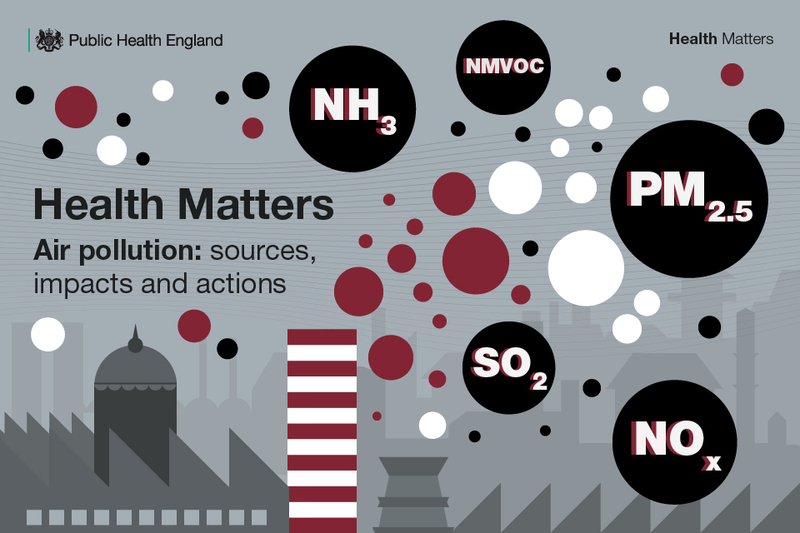 Welcome to the latest edition of Health Matters, PHE’s professional resource, which for this edition focuses on the sources and health impacts of air pollution, as well as the actions that local government, healthcare professionals and the public can take to reduce exposure and improve air quality. Air pollution is one of the major environmental determinants of health, and there is good evidence it has significant impact on, amongst other things, the incidence and severity of cardiovascular disease and lung health. It has both short and long-term health effects, and has a particular impact on children as they grow. Advances in engineering and technology mean significantly reducing air pollution to which people are exposed is now technically possible. For many pollutants considerable progress has been made already, with sustained drops in sulphur dioxide, particulate matter (PM) and nitrogen oxides made over the past decades in the UK. This overall reduction however masks significant local variation, with levels of PMs and NOx’s in particular still high in many areas of high population density, especially near roads. The degree of certainty about health effects varies by pollutant and disease. There is strong evidence for the harmful effects of lead, PM and sulphur dioxide but less certain evidence on the size of the effect of nitrogen oxides, ozone and ammonia. It is easier to provide evidence linking air pollution to sudden medical events such as asthma, heart attack and stroke. However, it is less easy technically to link gradual onset events, such as dementia and cancer, to chronic low-grade exposure so this evidence will inevitably accumulate more slowly. We can however obsess too much in trying to define the exact number of deaths and illnesses. The numbers are large, and whilst epidemiological evidence will continue to accumulate we already have sufficient information to act. For PMs and nitrogen oxides the evidence is easily good enough to be confident that reducing emissions, especially near places of human habitation, will be beneficial for many people. Air pollution is an international problem that affects everyone, but almost always the most socioeconomically disadvantaged suffer most from the health effects of pollution. 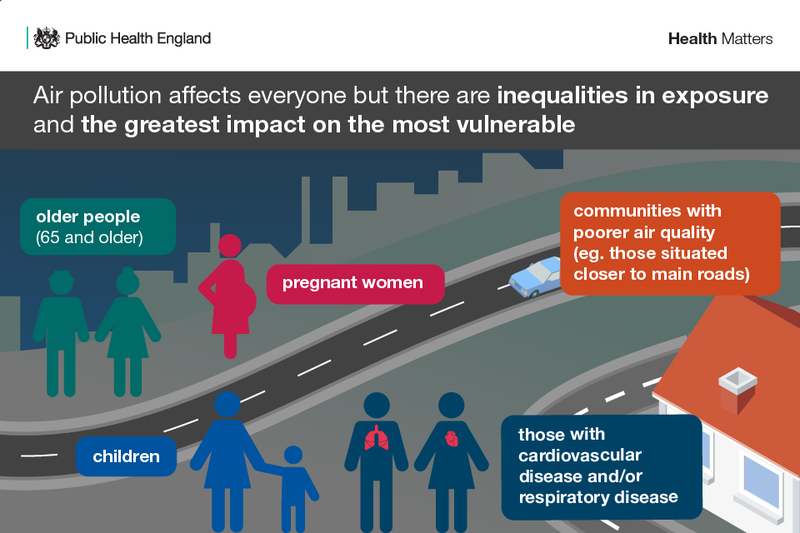 Other groups disproportionately affected include older people, children, pregnant women, individuals with existing medical conditions, and communities in areas of higher pollution. Are there economic benefits to investing in reducing air pollution? Between 2017 and 2025, the total cost of PM2.5 and NO2 combined is estimated to be £1.6 billion in models used in PHE’s cost of air pollution project. The Environment Audit Committee has estimated that total health costs as a result of air pollution range between £8.5 billion and £20.2 billion a year. Poor air quality can also have an economic impact by reducing productivity among people of working age. Defra estimated that in 2012, poor air quality cost the economy £2.7 billion through productivity loss. As with the evidence of harm the exact figures should be seen as estimates; what they demonstrate is that there are potently significant economic benefits as well as health benefits to set against costs. Air pollution is subject to strong advocacy positions on both sides. There will be some trade-offs between optimising economic and health outcomes but these are often exaggerated and it is possible to reduce air pollutants without damaging the economy. Historically, tightening regulations, for example in reducing then eliminating lead in petrol, or reducing PM tailpipe emissions from cars or sulphur dioxide emissions from industry has worked through spurring engineering innovation. There are already engineering solutions to most of the risks posed by air pollutants, and the question is how quickly we can move to them. The effect of a range of interventions to improve air quality has greater potential to reduce the associated burden of disease than any one intervention alone. To realise the greatest benefits, a strategic approach involving a combination of legislative, policy, behavioural and technological interventions is required. 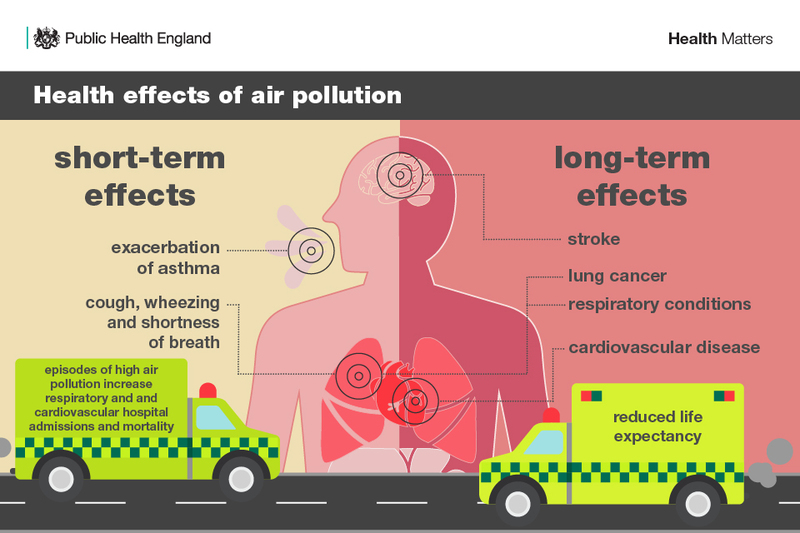 Read this latest edition of Health Matters to find out about the actions that local government, the health service and healthcare professionals, and the public can take to improve air quality and reduce exposure. Download the infographics to help you make the case for action at a local level. Health Matters is a resource for professionals, which brings together the latest data and evidence, makes the case for effective public health interventions, and highlights tools and resources that can facilitate local or national action. Visit the Health Matters area of GOV.UK or sign up to receive the latest updates through our e-bulletin. If you found this blog helpful, you can read other Health Matters blogs here. Wonderful post! I hope that more and more people will become aware how serious problem the air pollution is and pay more attention to our health and future. Missed a great opportunity here. Radon is the second leading cause of lung cancer after smoking, is easily measured and, where needed, reduced. But isn't mentioned in the section relating to improving air quality.